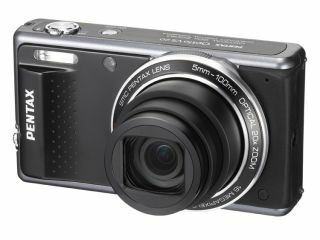 Pentax has announced a new 20x optical zoom compact camera, which also includes features designed for photographing in a vertical orientation. The Optio VS20 also features a 16 million pixel sensor and a 3-inch colour LCD display. An extra shutter release button and zoom lever are included to help when shooting photographs vertically. Other features include a new Handheld Night Snap mode, which is designed to help capture images in low-light conditions with minimal blur and noise. The 20x optical zoom lens is 28mm (35mm equivalent) at its widest end, stretching up to 560mm at the extreme telephoto end. Furthermore, an Intelligent Zoom function extends the zoom range to a whopping 4032mm (or 144x zoom). High quality macro, which allows shooting from a centimetre away, is another feature of the lens. Along with the extra shutter button, the camera automatically adjusts in on-screen display by using an orientation sensor to detect vertical alignment. A vertical position tripod socket is also included. The 16 million pixel sensor is a CCD-shift-type SR (Shake Reduction) mechanism, which promises to deliver photos with extra resolution, even when enlarged. The mechanism is also joined by Digital SR mode which detects the brightness of the environment to adjust sensitivity up to ISO 6400. Auto Picture is included for automatically detecting the most appropriate shooting mode, choosing from one of 15 shooting modes which includes Blue Sky and Sunset. Various camera settings, such as sensitivity and shutter speed are adjusted for best results. Three new scene modes are featured with the VS20, including Handheld Night Snap, Fish-eye and Sketch. Visual effect modes, such as Fish-eye, give you the option to decide the level of the effect on the LCD monitor. Face recognition has been upgraded, now with a new face recall function to put priority on a pre-registered face when optimising focus and exposure settings. Smile Capture mode to automatically release the shutter is also available, along with Blink Detection. HD video recording is available at 720p, with a dedicated video recording button on the back panel. The new digital filters can also be used when shooting video. At the back of the camera is a 3 inch 460k dot LCD screen, which is treated with Anti-Glare coating to help minimise reflections, stains and fingerprints. Other features include wireless remote control shooting (using a Pentax remote control), a choice of three shooting ratios and a bundled image editing software called Media Impression 3.1. The Pentax Optio VS20 UK price will be around £199.99 and it will be available from the end of February in black or white.